Doesn’t look like much, does it? A pleasant spot to sit and rest, maybe? A quiet urban oasis with a shallow pool, some art, and hopefully a little peace and quiet. Indeed, this area above the Musée du Panthéon National Haïtien (MUPANAH) is all of these things, but it’s the amazing treasures tucked away below that really make this place worth checking out. Located in the heart of downtown Port-au-Prince, the museum first opened its doors in 1983, though you’d be excused if you, like me, have trouble finding those doors on your first visit here. That’s because the museum is almost entirely underground, a cool characteristic of its construction that allowed the facility to emerge from the 2010 earthquake virtually unscathed. Beneath the sculpture garden sitting area, the MUPANAH houses one of the most incredible collections of historic artifacts found anywhere in the Caribbean. The big highlight for most is a hulking, 13-foot tall rusted anchor salvaged from Columbus’ flagship, the Santa Maria, which ran aground on Christmas Eve 1492 near what is today the city of Cap-Haïtien on Haiti’s northern coast. I’m no expert on museums, but I don’t know of any other place with so sizable and impressive a piece of history from the journeys of Columbus. I’ve certainly never seen anything like it, which made my MUPANAH visit memorable in and of itself. Still, I found myself more entranced by the remnants of Haiti’s various monarchies – the regal robes and amazingly elaborate crowns from the days of Henri Christophe, King Henry I of Haiti, who reigned from 1811-1820, and Faustin Soulouque, Emperor Faustin I of Haiti (1849-1859). 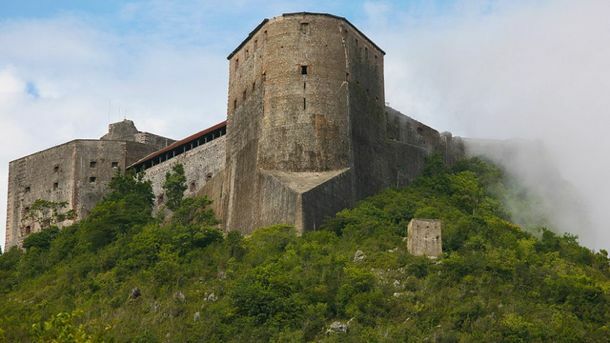 Just like Sans-Souci Palace and The Citadelle Laferrière, the grandeur of the royal artifacts were astounding when considered in the context of Haiti’s earliest beginnings – the only country in the world where African slaves won their freedom. So yeah, you’ll have to take my word on this one and visit for yourself to really experience what this uncommon museum underground is really all about. It only costs US$5.00 to get in, but if you love Caribbean history, the experience is priceless. Last updated by Steve Bennett on 07/14/2014 . Le Negre Marron is a powerful symbol, made even more so by the tragic 2010 earthquake. Stroll among the monuments to Haiti's heroes in Champs de Mars and it quickly becomes evident which one seems to be held in the highest esteem.